Your child will receive a high quality academic education within a supportive and nurturing environment. We are a small community - we know the needs of each child. We have dedicated and highly trained teachers. We pride ourselves on developing and educating children to be curious, collaborative and connected learners. We have a strong focus on values. St Thomas More’s is conveniently located to Civic, Majura Park, Russell Offices and Campbell Park. We have a dedicated Defence Schools Mentor and provide support services for Defence families. 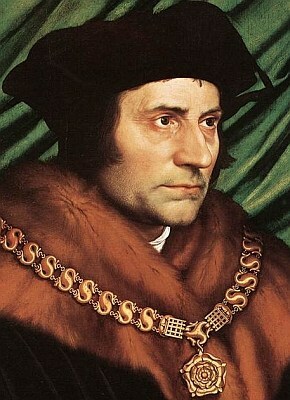 St Thomas More lived in England about 400 years ago. He was an English lawyer, social philosopher, a prolific and respected author, statesman and a monk for a short while. He was a councillor to King Henry VII. He worked tirelessly to defend the Catholic Church and didn’t agree to the King’s intention to become head the Church of England and breakaway from the rules of the Catholic Church. The King was offended by Thomas’s conviction and refusal to take the Oath of Supremacy and sent Thomas to the Tower of London to try change his mind. Thomas spent more than a year in prison, finally convicted of treason and executed. Thomas More said, “I die the King’s good servant, but God’s first”. He died knowing what he believed was true. Thomas More lived a life of Wisdom, Courage and Peace. We treasure the life of Saint Thomas More through the values of Wisdom, Courage and Peace. St Thomas More was a person of Wisdom. He loved learning and was a person of great intellect. He strived to seek the truth. St Thomas More was a person of Courage. He persevered and stood up for what he believed in despite adversity and oppression. He had a strong faith in God. St Thomas More was a person of Peace. He forgave those who opposed him. He was God’s servant first. St Thomas More’s Primary School, Campbell, established by the Sisters of the Holy Faith in 1961, is a Catholic Archdiocesan School that follows the guidelines and policies set down by the Catholic Education Commission of the Archdiocese of Canberra and Goulburn. Being a small school, we are able to provide a special opportunity for children to develop in a friendly atmosphere where the needs of each individual are recognised and catered for. As approximately 50% of our children come from Defence families, we are familiar with the challenges of relocation, and create a secure environment where all children grow in self-esteem and self-reliance. St Thomas More’s is a parish-based school consisting of classes for children from Kindergarten to Year Six. The class structure consists of single grade and multi-age class groups. Christian Meditation is a contemplative form of prayer that allows children to experience and develop their innate capacity to be open to God. Through silence and stillness of body and mind, children let go of thoughts and move from their ‘heads’ to their ‘hearts’, repeating internally, the sacred word “Maranatha”. Christian Meditation takes children journey to ‘be with God’- Centred in Faith. Christian Meditation is a common, lived practice at St Thomas More’s. When we Respect More we respect ourselves, others and property. We play fair, safely and wear a hat. We include others and listen to one another. When we Think More we make wise choices, be a learner and tell the truth. We take responsibility for our actions. When we Encourage More we praise others and take pride in ourselves, our work and the way we interact with others. We strive for excellence, are welcoming and act with compassion. Stanley Savige is a remarkable individual we connect with our house Legacy. There are two places in our local area that pay tribute to Stanley Savige and they are just around the corner from our school. He was a quiet and modest young man. Aside from work, he was also a Sunday school teacher in the Baptist Church and a scout leader. He enlisted in the Army on 22 March 1915 and was allocated to infantry. He landed at Gallipoli in September and was among the last to leave in the Anzac’s withdrawal. In 1916 he was sent to France where he was involved in major battles. He was awarded the Military Cross for his 'consistent good work and devotion to duty'. In 1918 he commanded an operation that saved 50,000 Assyrian refugees in the Middle East for which he won the Distinguished Service Order. After WW1 he started an organisation called Legacy which looked after widows and children of servicemen who had died in the war before serving as a commander in WW2. Legacy remains an important national organisation. Alexander Moore Forbes represents the house of Honour. Forbes Block is located at Duntroon where many of our school families live. Alexander Forbes was born on 19 May 1892 in Victoria. He was the second cadet on the roll when the Royal Military College Duntroon opened in 1911. He became the first Battalion Sergeant Major, and was given a very special award called the Sword of Honour for his exemplary conduct and performance of duty while he was a cadet. When he was a senior cadet, he was in the Guard of Honour on the day that Canberra was recognised as being the Capital of Australia. He died in the year Duntroon celebrated its 50th Anniversary and his son donated Alexander Forbes’ Sword of Honour back to Duntroon. That sword is still carried by each of the Battalion Sergeant Majors at Graduation parades. There have been at least three parents of children who have attended St Thomas More’s who have been awarded the Sword of Honour in the past. After his graduation, Alexander Forbes was allocated to Artillery. He served in Gallipoli in 1915 and France in 1916 where he earned a Military Cross. Alexander Forbes was also in the Army during World War 2. Albert Jacka is our representative for the house of Valour. He was the first Australian to receive a Victoria Cross in World War One, the highest award for bravery. There are two places in our local area that pay tribute to Albert Jacka and they are both very close to our school. One is a street called Jacka Crescent. The other is Victoria Cross Park where there is a plaque with Albert Jacka’s name on it. Jacka Crescent actually comes off Savige Street. On the Jacka Crescent street sign there is a picture of a Victoria Cross Medal. Albert Jacka was awarded a Victoria Cross for his bravery in Gallipoli.His story is one of extraordinary human endeavour. When Albert Jacka returned from the war, he became the Mayor of the City of St Kilda in Melbourne. His health was not good and he died in hospital at the age of 39. His former commander said “Jacka was more than a fighter – he was a genius. He had that superb quality of knowing when to act and how to act, and the sublime courage that made what seemed impossible, possible”.